Creamware's Minimax ASB, the company's hardware recreation of the Minimoog, won over the critics — can they repeat the winning ASB formula with Sequential Circuits' Prophet 5 synth? The Prophet first appeared in early 1978. Before then, most UK synthesists were restricted to monophonic instruments like the Minimoog, ARP Odyssey or EMS VCS3. In the right hands these could all produce a healthy racket, and the Minimoog in particular impressed the playing community with its massive bass and searing lead sounds. All the same, the single-note limitation was frustrating for chordally-minded keyboardists like myself. When, we wondered, would Bob Moog invent a polyphonic Minimoog? Unfortunately, when it arrived, the long-awaited Polymoog lacked the sonic weight of the Mini and failed to capitalise on that classic synth's simple but innovative design. The gap in the keyboard market was eventually filled by a far less famous name: step forward Dave Smith, a bright young designer who later helped to create MIDI. Armed with Mr Smith's visionary ideas, the Californian company Sequential Circuits announced a new five-voice polyphonic synth with 40 programmable presets that you could recall at the touch of a button. For sonic adventurers and gigging keyboardists like myself, this was a dream come true. The Pro 12's rear panel is an exact duplicate of Creamware's previous ASB, the Minimax, featuring just a mains connector, audio input and output pairs and two types of MIDI connections: the traditional five-pin trio and a USB socket. The latter is also used by the Pro 12's software editor.Photo: Mike CameronI'll reminisce further about the charms (and foibles) of the Prophet 5 in due course, but for now, here's a brief technical history: the original 1978 instrument, christened the 'Rev 1', soon proved to be unstable (I heard a rumour that one unit overheated so badly it burst into flames). This hot new product was hastily replaced by the less incendiary but more reliable Rev 2. Various ad hoc modifications to the latter (including a cassette-dump facility for program data) were subsequently incorporated into a new build called the Rev 3, and this became Sequential's best-seller. Most working Prophets found nowadays are Rev 3 models, although some Rev 2 models (including mine) survive. Experienced Prophet-heads can detect a subtle difference in sound between the Rev 2 and Rev 3, but in the real world — at a gig, say, where the synth is blaring out over the PA in mortal combat with guitars and drums — you won't hear the difference. 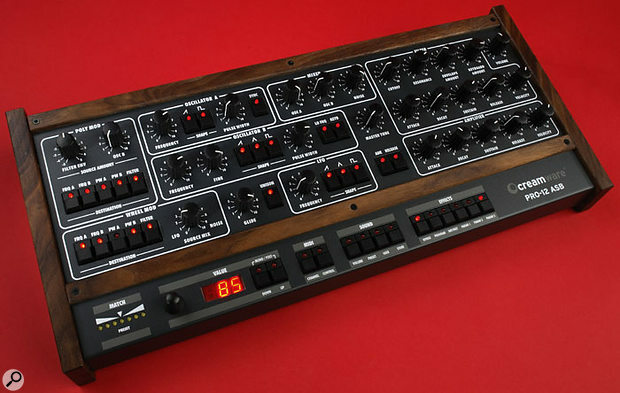 Like NI's Pro 53, Creamware's Pro 12 ASB instrument ('Authentic Sound Box', apparently) is modelled on the Rev 3 Prophet 5. The big difference between NI's and Creamware's emulations is that the Pro 12 is a hardware unit (hooray! ), bristling with real knobs and buttons (double hooray!). Rather touchingly, the design and markings of the controls even echo those of the old synth. At just under 19 inches wide and eight inches deep, the unit corresponds in size to the Access Virus and Clavia Nord desktop synths, but still manages to combine all of the Prophet 5's original controls and add several new ones in an area less than half the width of the original's control panel. Though this inevitably makes the panel less spacious, the buttons and pots are neatly and logically laid out with no overcrowding. Having endured the knobless hell that was the Yamaha DX7 and gritted my teeth through the tedious mouse-fumblings required by virtual synths, I can't tell you what a relief it is to reach out and grab a physical control to make a quick sound change. Thanks for that, Creamware. No review of a Prophet clone would be complete without a mention of the brilliant 'Poly Mod' section. 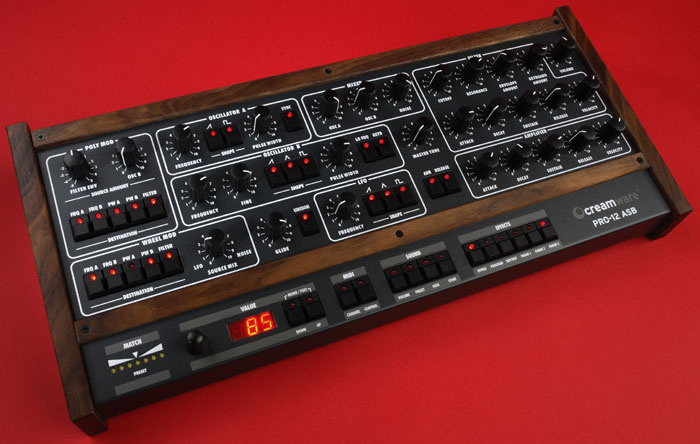 This is what separates the Prophet from virtually every other synth, and lies at the heart of its ability to make highly characterful sounds. By using Oscillator B and the filter envelope to modulate oscillator frequency, pulse width and filter cutoff, one can create all manner of outrageous distorted and clangy noises, as well as delicate and unusual sounds such as quasi-plucked string effects. Creamware have extended the Poly Mod capabilities by adding Oscillator B's frequency and pulse width to the destination list, which gets the thumbs-up from me. One update to watch out for is that the Poly Mod 'filter envelope' pot's nominal zero position is a setting of 63; higher numbers produce positive envelope curves, while settings of 0 to 62 produce a negative curve. Anyone wanting to mount the Pro 12 upright in a rack will need at least 6U of spare rack space, as once audio jacks are inserted, the unit stands around 10 inches high. An alternative would be to place it in desktop position on a rack tray, but then you wouldn't be able to get at the controls. Either way, Creamware don't supply rackmounting accessories. The back panel (shown overleaf) has analogue stereo outputs and inputs (all on quarter-inch jack, the latter designed for processing external audio signals), MIDI In, Out and Thru and a USB socket for computer connectivity. There is no digital audio out; the sole remaining back-panel socket is for the 12-volt power supply plug. Sad to say, the latter is of the dreaded 'wall-wart' variety, with a European two-pin plug. Creamware supply a three-pin UK mains plug adaptor, but on the review unit, the latter was incredibly cheap and nasty. Made of thin brown plastic and too loose-fitting for comfort when attached, it was a disaster waiting to happen. When I plugged it into a wall socket, the loose grip caused the heavy power supply to fall out, and when I inserted it into a plug board, it formed an ungainly 'L' shape which did its best to trip me up every time I stepped over it. I wouldn't even think about using it on stage. I had prepared a paragraph exhorting Creamware to stop supplying it immediately when I heard that they had already done so. Sturdier black adaptors with locking screws are now apparently in use — so if you get one of the brown ones, ask for a replacement. And so to the main issue — the sound. It's one thing to make a 21st-century box's controls resemble those of a 30-year old vintage synth, but quite another to emulate the exact sonic nature and timbral idiosyncracies of a historic analogue keyboard. Fortunately, from the moment I first played a note on the Pro 12, I knew this was not only a very decent Prophet 5 soundalike, but also a good, solid synth in its own right. The review unit arrived shortly before a recording session, so I took the opportunity to take it to the studio and give it a whirl. There was no time to study the synth's intricacies or audition all of its 127 factory presets. Instead, I dived in and quickly created a few basic sounds from scratch. These fitted the bill admirably: the Pro 12 sounded big, strong, clean and commanding straight out of the box, with plenty of bottom end, a good deal of analogue-style warmth and a fat-sounding filter which smoothly ran the gamut of tones between soft and strident. All present agreed that Creamware's creation was a good synth, and from my point of view, working with it was just like operating the original keyboard back in the day, except that I didn't have to re-tune it every 20 minutes! I was pleased to find the separate control for the MIDI receive channel, as too many MIDI units hide this vital setting deep within a hidden menu. The bright, cheerful red LEDs and logical layout of the control panel made programming easy — the only procedure which wasn't immediately obvious was how to store new sounds, but a quick read of the manual soon made that clear. Having passed its initial audition with flying colours, the Pro 12 came home with me and I spent some time investigating it in more detail. The factory sounds cannot be overwritten, but new patches can be saved in the 127 user preset slots (these are initially a copy of the factory presets). Being a keen programmer, I rarely use factory sounds, and felt that the ones provided don't do full justice to the instrument. Having said that, they are a lot better than the 40 rather feeble noises that shipped with the Prophet 5 in 1978; the thunderous, brain-buckling unison basses, shouty brass pads, pristine organs and raw, trancy lead patches of the Pro 12 demonstrate its versatility reasonably well. The lack of a good analogue string pad is arguably the biggest omission, but take it from me — the Prophet 5 is capable of creating absolutely beautiful string, flute and voice pad sounds, and after a bit of judicious tweaking the Pro 12 will too. Photo: Mike Cameron Photo: Mike Cameron Pulse waves compared: the one from Dave Stewart's Rev 2 Prophet 5 (top), from a Rev 3 Prophet 5 (middle), and the Pro 12's offering (above).Photo: Mike CameronBack in the '70s, Sequential Circuits service staff used to complain that when Prophets came back for repair, they very often had their original factory sounds intact, indicating that users were scared of programming their own. I'm sure SOS 's readers are more adventurous, but in any case you'd be daft not to try your hand at programming the Pro 12: its controls have a nice, solid feel, and (unlike the original synth and NI's Pro 53 virtual version) each individual parameter value can be displayed on screen, which makes sound-building a very precise business. When you turn a pot, its new setting automatically appears in gloriously large, bright red LED numerals in the 'Value' display. To discover what the stored settings are, you look at the 'Match' strip at the bottom left of the Pro 12. This row of seven yellow LEDs gives you constant visual feedback on discrepancies between the current and stored pot value, and when the two values match up the central LED blinks reassuringly. Up and Down buttons and a nice data wheel-style continuous pot make it easy to input data quickly; there is, however, no 'compare' function between edited and stored sounds. The front-panel controls of the Pro 12 can be seen in detail in the header photo. If the features seem over-familiar, that's because virtually every synth designed since 1978 has been influenced by Dave Smith's brilliant blueprint! On the Pro 12, all the good points of the original remain, one example being that the two main oscillators have separate volume controls, rather than the single balance control used by many contemporary synths. Most of the new functions are contained in Creamware's 'Configuration Strip' control section. For me, the most appealing design feature is that, with the exception of the 'value up' and 'value down' buttons (which double as monophonic/polyphonic toggle switches when pressed together), there are no multiple-function controls or hidden menus. All buttons are of the on/off toggle switch type with an embedded red LED indicating 'on' status, most pots have a programmable value of 0 to 127, and all of the controls perform their single stated function. It's a beautifully simple system which should encourage experienced and novice synth users alike to overcome their fear and get programming! Authenticity being the chief selling point of this product, it seemed appropriate to carefully compare Creamware's digital emulation with an original Prophet 5 synth. In this I was helped by my friend Richard Barbieri, formerly a member of Japan, who kindly lent me his Rev 3 Prophet 5. Photo: Mike Cameron Photo: Mike Cameron Comparing sawtooths (top to bottom): the Rev 2 Prophet 5, the Rev 3, and Pro 12.Photo: Mike CameronThe most important consideration was to compare the basic waveforms. Having set both instruments to play a one-oscillator, unfiltered 50-percent pulse wave at the same pitch, I must confess I couldn't hear any difference between them. The same was true of the sawtooth and triangle waves. On listening more analytically, I thought I could detect a slightly more metallic 'edge' in the Pro 12's pulse wave compared to that of Richard's Prophet 5. The difference (if there was any) was extremely subtle, so I decided to record the waveforms (including those of my battered old Rev 2) and check whether my eyes could verify what my ears were suggesting. The results are shown in the waveform traces opposite, which are graphical representations of the waveforms generated by my Rev 2 Prophet, Richard Barbieri's Rev 3 instrument and the Pro 12 ASB as shown in Apple's Logic Audio, using identical front-panel settings and a MIDI note playing the 'C' below Middle 'C'. For ease of comparison, I inverted the phase of the Pro 12's sawtooth wave, which for some reason was out of phase with those of the two Prophets (this doesn't affect the sound, only the up-down orientation of the waveform). The results show interesting differences; Richard's Rev 3 comes closest to the perfect square waveform one expects a full-width pulse wave to produce. The Pro 12's sawtooth wave appears to be the most geometrically precise, while the prize for the best-looking triangle wave goes to the Rev 3, with the Pro 12's and Rev 2's versions appearing to be more or less the same, although the eagle-eyed among you will notice that the Pro 12's pulse and sawtooth waves both show small 'spikes'. Although such graphics provide interesting theoretical insights, one should remember that we're dealing with sound, not vision — and although my Rev 2 undoubtedly sounds a little warmer than the other two instruments, the three synths sound practically identical. Any small differences of timbre can be offset by filtering and EQ, and are therefore ultimately likely to prove insignificant. Rest assured that the Pro 12 really does sound like a Prophet 5, as Creamware intended! The Pro 12 is supposed to produce 12 polyphonic voices (hence the name), but when I tested this, playing and holding descending notes in a scale, I could only get eight out of the review unit. Mind you, that's still a 60-percent improvement on the original! A more academic difference is that the minimum width of the oscillator pulse wave is set to around five percent; on the old synth it went right down to zero, which makes the sound disappear altogether! However, by applying pulse-width modulation, it is still possible to reduce the pulse width to zero, which is useful for certain esoteric programming techniques. When the Pro 12's sawtooth wave and pulse waves are superimposed, the overall level increases slightly (as it does on my old Rev 2 instrument), while repeating the procedure on a Rev 3 produces a 6dB volume boost — not a desirable side-effect if all you seek is a subtle timbre change. But because individual patch volumes are programmable on Creamware's unit, any potential volume discrepancies from patch to patch can now be ironed out. Photo: Mike Cameron Photo: Mike Cameron Finally, the triangle waves. Again, from top to bottom, these are the waveforms output by Dave's Rev 2 Prophet 5, the Rev 3 Prophet, and the Creamware Pro 12 respectively.Photo: Mike CameronAs I mentioned earlier, the Pro 12's filter has a satisfyingly analogue sound, and I was pleased to find that adjusting its cutoff setting while notes are sounding produces no 'stepping' — tonal transitions are as smooth as they were on the original synth. The filter self-oscillates when its resonance control is turned full up. On my Rev 2, this effect is frighteningly loud (as my '70s band colleagues, sadly now all completely deaf, will testify), but the Pro 12's filter oscillation whistles out at a far more moderate level. Velocity control and aftertouch (new-fangled inventions we had to manage without in 1978) can now be applied to both amplitude and filter cutoff settings, adding greatly to the instrument's expressive potential. On the amplifier side, the classic ADSR envelope controls can be reduced to ADR at the touch of a button; this means that you can audition presets with their sustain turned off, a handy way of finding choppy rhythm sounds! When it comes to using the Pro 12 for rhythm parts, the combination of its unwavering sound and fast, positive-sounding envelopes marks a distinct improvement over the original. If anyone out there still pines for the days of 'beat tuning', I'm afraid that's no longer practical; being a digital instrument, the Pro 12 doesn't slide randomly out of tune like its analogue forefathers. Rather than producing a continuously variable pitch, its master tune pot outputs a precise series of stepped changes, with the default setting (63) equating to A=440Hz. A setting of zero makes the instrument five semitones flat, and setting it to 127 sharpens it by the same amount. Among the improvements Creamware have brought to Dave Smith's original design are a full MIDI implementation which gives sequencer control over virtually all the front-panel parameters. As one would expect, external MIDI Clock can also be used to control LFO speed, permitting the effort-free creation of tempo-synchronised shudders, hypnotic pulsations and groovy wobbles. And because no-one ever uses analogue synth sounds without adding delay or chorus (this was as true in 1978 as it is now), there's also a fairly extensive stereo effects section: five types of delay, chorus and combined delay/chorus programs, each with three programmable parameters. The 'glide' feature is one of the most distinctive features of analogue synths and can be used to create all sorts of entertaining sound effects: sirens, Star Wars lasers, jets taking off, sci-fi noises, and so on. On the original Prophet 5, setting the glide control to maximum produces a five-second glide from the bottom key to the top. On the Pro 12, the same setting produces a glide of only half a second's duration over the same pitch range. Though adequate for Keith Emerson-esque 'Lucky Man' Moog impersonations, this is way too fast for full-blown Tim Blake/Brian Eno psychedelic effects. To recreate those heady noises, Creamware need to make their glides run slower — if they need advice on how to achieve this, I'm sure the Connex rail company will be able to offer suggestions. I said earlier that the Pro 12 has no hidden menus — well, that's not entirely true. The synth ships with its own editing and librarian software supplied on CD, and if you delve into the editor you'll find some useful functions (including input volume) that are not accessible from the synth itself. The version on my CD declared itself to be a beta, and no full version was yet available as this review went to press. Nevertheless, installing the software on my PC was straightforward, and once I'd hooked up the Pro 12 to a spare USB socket I was able to control the synth from the computer (and vice versa). If you're running out of USB sockets, it's apparently possible to achieve the hook-up using a two-way MIDI connection. It's good to see so many hardware controls on the Pro 12 encouraging hands-on use. The synth has several knobs and buttons not found on the original Prophet 5, such as Filter and Amplifier Velocity Amount, the dedicated ADR button for the envelope, and switches to assign the frequency and pulse-width of Oscillator B as the modulation destination in the flexible Poly Mod section. And that's without even mentioning the switches for the built-in effects...Photo: Mike CameronThe editor has three control screens, called Main, Add and Effects. The first is an exact replica of the synth's control panel and the last is self-explanatory, leaving the 'Add' screen to display the instrument's additional functions. I needed to reset the synth's pitch-bend range to four semitones, so I dialled up the 'Add' screen and quickly found the relevant control. Unfortunately this part of the beta editor doesn't work properly at the moment — the low values are out of kilter, so setting a value of four semitones produces a bend of five. Moving on, I fiddled with the controls governing 'Unison' mode; these include a 'detune' setting to simulate the racket made by five (or in this case, eight) analogue oscillators trying to play the same note. I found a detune value of five (out of 10) sounded the most realistic! This detuning only works in unison mode — it's not possible to detune individual voices when using the Pro 12 polyphonically. Creamware have introduced flexibility to the hitherto one-dimensional Unison mode — it can now work in legato or 'retrigger' mode (the latter means that the envelope curve is triggered by every note, as on the original Prophet) and can be set to play any number of voices up to the theoretical maximum of 12 (or, in the case of the review unit, eight!). There's also a choice between 'low-note priority' (as found on the Minimoog) or 'last-note priority', but the latter doesn't behave exactly like a real Prophet; in unison mode, the old synth cuts off a sustained note whenever a new one is played, whereas the Pro 12 allows the sustained note to play on regardless until you release its key. This is better musically, because when soloing on the old synth I would often find my triumphant sustained notes cut off in their prime because I'd accidentally brushed another key! I noticed another small difference between the vintage synth and the new pretender — the Pro 12's LFO sawtooth and pulse waveforms produce positive pitch variations when applied to oscillator pitch, whereas these waveforms on the original LFO produced negative variations. I was therefore gratified to discover the 'LFO phase' setting on the 'Add' page, but my hopes were soon dashed when I discovered that this control has absolutely no effect on the LFO with the current version of the Editor. But another, very useful additional control worked just fine — the 'Mod Wheel Offset' setting allows mod-wheel modulation to be pre-programmed into patches at whatever intensity you require, thereby freeing the left hand from mod-wheel duties. Round about this time the beta editor began to freeze at regular intervals, so I decided to quit while I was ahead. I hope Creamware will be releasing an improved version to fix the various faults in the future. Photo: Mike Cameron Photo: Mike Cameron If you're looking for an instrument, which, like the Pro 12 ASB, sounds like a Prophet 5, then you could always seek out... a Prophet 5! However, as noted elsewhere in this article, many original Prophet 5s are now becoming unreliable, and spare parts are increasingly scarce. If you must have the real thing, your best bet is to seek out a reconditioned model from a specialist supplier like Wine Country in the USA (see www.winecountrysequential.com). Software emulations are, naturally, much cheaper, and there are of course many software instruments that model analogue synthesizers generically — but products designed specifically to mimic the Prophet 5 are fewer. 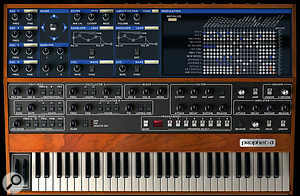 With the help of original Prophet 5 sound designer John Bowen, Native Instruments produced Pro 5 in the early days of virtual instruments, which was later superseded by Pro 52 and Pro 53 (shown above right, and reviewed back in SOS February 2003). However, as one of the earliest software instruments to come out, Pro 5/52/53 doesn't perhaps sound as close to the original hardware as some of the recent software synth emulations we've seen released. John Bowen obviously felt he could improve on it, as his company Zarg Music released their own Prophet emulation a few years after Pro 5. Called Prophet Plus, this was reviewed in SOS in June 2003. However, Prophet Plus runs only on Creamware's Scope DSP platform. 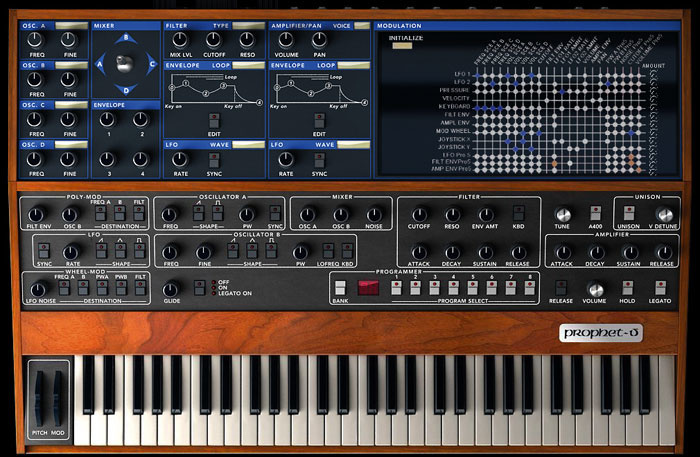 Perhaps the best software Prophet emulation is yet to come, in the form of Arturia's Prophet V (shown above), which models not only the Prophet 5, but also Sequential's later digital Prophet VS synth. However, it's hard to tell at this stage, as Prophet V is just about to be released as this article goes to press! Look out for an SOS review soon. One last gripe — the manual. Though well thought-out, logically structured and visually helpful, it's marred by typos, careless spelling mistakes ('oscillator' is spelt four different ways) and a rather slapdash translation which leaves some difficult technical words in their native German rather than attempt an English version. Nonsensical references to the 'Minimax' also indicate that no-one has bothered to proof-read the text. While the meaning is generally clear (at least to anyone who knows a bit about synths), this sloppy presentation is completely at odds with the sharp thinking which went into the Pro 12's design, and at worst, could confuse and alienate a few beginners. Let's hope that someone at Creamware commissions a rewrite very soon, because dodgy equipment manuals are one aspect of the '70s music scene we don't want to see revived! Much has been written about the desirability of warm, organic analogue sound over cold, electronic digital audio. Though there is undoubtedly some truth in this when comparing a well-recorded tape of acoustic instruments and voices to a digital recording of the same thing, when it comes to purely electronic synth waveforms, the whole debate seems less crucial. But to even the most hardened of back-to-analogue zealots, the Pro 12 ASB must surely represent decent progress. Here you have a very good, in-tune, lightweight and convenient recreation of a well-loved and deservedly popular synth whose surviving models are becoming ever more difficult and expensive to maintain. It must be said that even in its heyday, the old Prophet 5 was prone to throwing a wobbler. I shall never forget standing on stage with Bill Bruford's band trying to look nonchalant while the bloody thing randomly cycled through its 40 presets due to some obscure fault. I learned that night that electronic elephant calls aren't really the sounds you want for a quiet ballad. Compared to that, the Creamware's minor malfunctions pale into insignificance. The Pro 12 is impressive; a near-perfect facsimile which sounds like the real thing. Indeed, if Creamware ever decide to attach a five-octave keyboard to their cute little box, it could very well become the new real thing in years to come! It sounds just like a Prophet 5! At last, a hardware Prophet recreation with real knobs, constructed from sturdy materials. The control panel is very logically designed and has very nice controls. Additional contemporary features bring the Prophet into the 21st century. The unit ships with its own editing and librarian software. The manual is riddled with typos and is incomprehensible in places. When editing, there's no 'compare' function between the edited and stored sound. It works in single patch mode only. The SOS review unit could only produce eight of the promised 12 voices. The Prophet is dead (well, nearly) — long live the Pro 12!